Tumor biopsies are often Formalin-Fixed and Paraffin-Embedded (FFPE) for histological staining, genetic testing and archival purposes. Formalin treatment preserves tissue by crosslinking proteins, but also leads to mutation of the nucleic acid bases and poses a challenge to identification of true variants in the tumor using next-generation sequencing (NGS) methods. Studies have shown that it is possible to isolate high quality nucleic acids from good FFPE samples and to profile small variants using NGS. These studies used tissue fixed with 10% neutral buffered formalin for 24 hours, a standard protocol in the pathology field. In our initial handling of FFPE samples we found that the quality of the isolated DNA and subsequent sequencing results vary widely. We hypothesized that this may be due to deviations from the standard protocol, such as inaccurate logging of the fixation protocol, variation in the fixation time, and varied storage conditions of the samples. 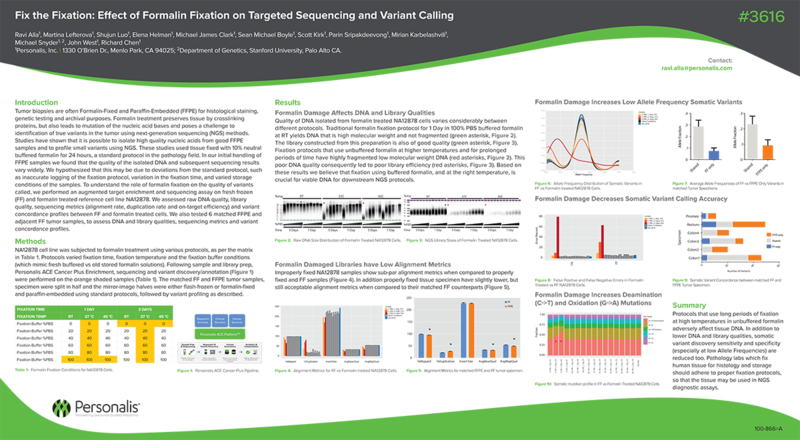 To understand the role of formalin fixation on the quality of variants called, we performed an augmented target enrichment and sequencing assay on fresh frozen (FF) and formalin treated reference cell line NA12878. We assessed raw DNA quality, library quality, sequencing metrics (alignment rate, duplication rate and on-target efficiency) and variant concordance profiles between FF and formalin treated cells. We also tested 6 matched FFPE and adjacent FF tumor samples, to assess DNA and library qualities, sequencing metrics and variant concordance profiles.